With layout all marked up, it’s time to cut the opening. 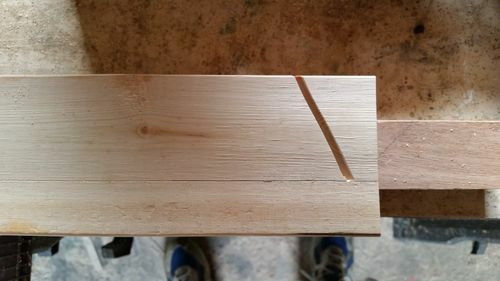 I did this with a sliding compound miter saw and the plane was designed to make that the best tool to use. 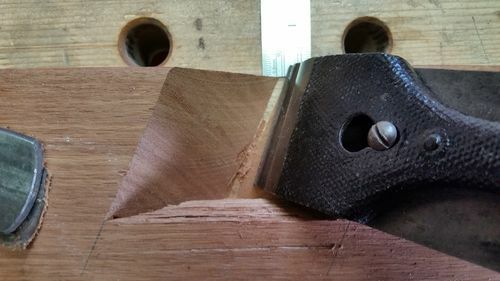 If you don’t have a SCMS or are just more comfortable with a table saw and miter gauge or handsaws, no reason not to use them. 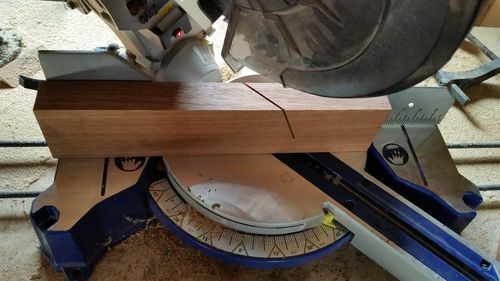 For a miter saw, set the bevel to 20 degrees and the miter to 45 degrees. Hopefully you have a depth stop. If so, mark the proper distance up from the table on a piece of scrap and do some test cuts until it’s just kissing the line. 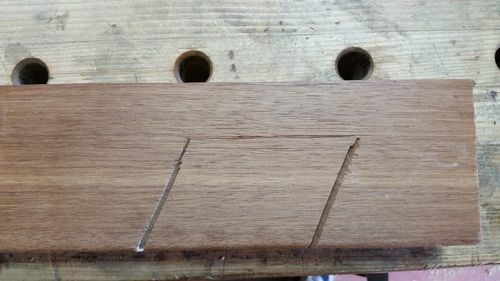 Again, make sure your mark matches the distance from the table on your wood blank, not the depth of cut, unless your scrap is the exact same width as your blank. Once the depth is set, you can make the first cut on the wood body blank. 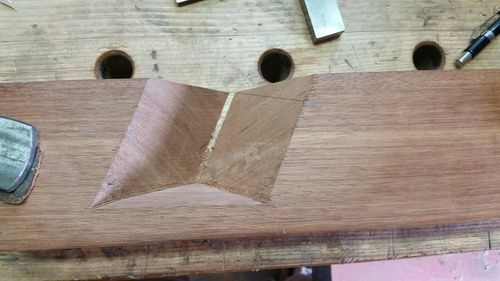 The cut will most likely not exactly match the skew angle that is marked out, though it should match the 45 degree bed angle. That’s OK. Unless you are an engineer and want to do the math, the compound miter causes the angles to skew off a bit. The reason for marking up the blank is to ensure you are cutting everything the right direction. Now, leaving the bevel angle alone, switch the saw to the opposite 45 degree miter angle and make the second cut. The goal is to have the blade track through the exact same opening where the mouth is going to be. Depending on your saw, it may or may not cut clear to the line on the back side. 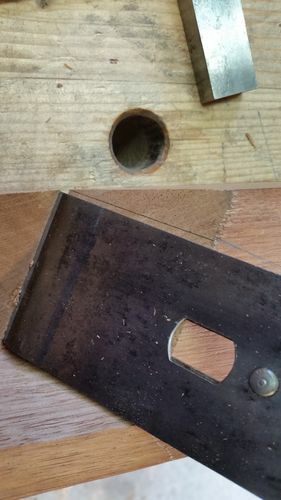 Mine does not, but it’s a simple matter to either put in a spacer on the miter saw or finish out the cut with a handsaw, as I did. You can see the difference in the kerf width. 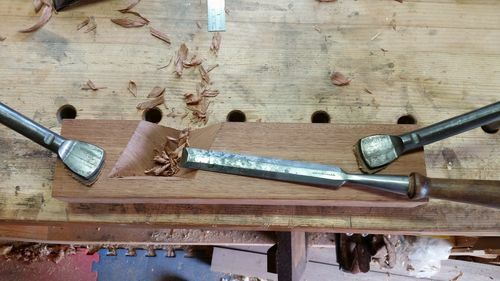 To remove the waste, a couple light blows with mallet and chisel will pop most of it out. The back surface will be rough. That is not a problem, we are going to have to pare it out anyways. Using the frog and iron, measure or mark out about how far back you will need to pare to get everything to fit. Then a hand saw can be used to extend the angles down to that line. Do not cut the mouth itself any deeper, the cut should angle from the mouth opening to the top face. With a sharp chisel, pare back the body to your mark. The paring cuts will taper from being wider at the top to just hitting the edge of the saw kerf at the bottom. You’ll end up needing to match the skew with this face of the opening. 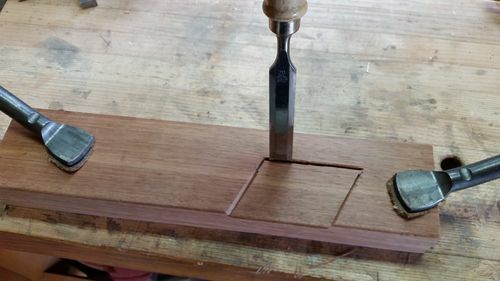 A wider chisel is best, as it allows better registration against the bed that the saw made. 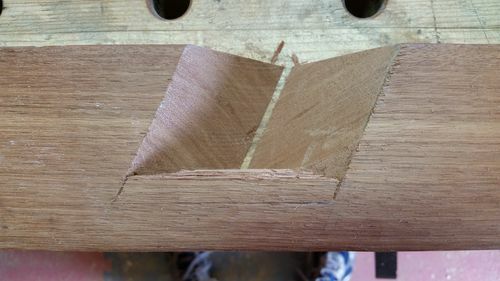 Since you may need to be cutting some end grain, make sure the chisel is SHARP. As you get close, use the iron to check width. 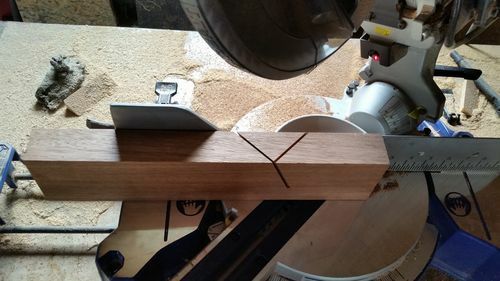 A small square can be used to mark a line on the bed perpendicular to the skew angle that will make it a lot easier to see when you are getting close. Once the body is pared back enough to where you can lay the iron in and have about 1/8 inch between the iron and that line, you are good. Do any final paring you want to clean up the surfaces. Thanks JT, pretty awesome of you to share this knowledge. Passing on these traditions of using tools like a shooter is going to stay alive because of people like you. I glued up my lamination this evening. Still need to grab screws but I am following along and will work on this more this weekend mostly but will try to find time this week. I have a band saw, miter saw (not compounding), some old disstons hanging around sharp and ready, and a ryobi. I think I will start the cuts on my miter saw and finish with a disstons or ryobi. I don’t think I trust my accuracy to do the whole cut at those angles by hand. I might cut a 2×4 straight through on the miter saw to use as a saw guide and do it by hand with the crutch. Not sure yet but I’ll be a little nervous either way. Thanks again for the write up. I meant Ryoba saw…spell check I suppose hit me on that one. Not sure why I noticed this morning. Sorry I have not commented JayT, but I have been keeping up with your blog. Good stuff!